RAWALPINDI Aug 26 (APP): Chief of Army Staff General Raheel Sharif Friday visited Army Medical Center, Abbottabad, Inter Services Public Relations (ISPR) stated. (AMC), COAS appreciated contributions and sacrifices of doctors and paramedic staff in improving the health care standards in peace and war especially in fight against terrorism. The COAS lauded the efforts of AMC in up gradation of hospitals, specially the specialized treatment including, liver transplant unit, hands and upper limbs surgery center. Their training establishments like National University Medical Sciences (NUMS) and paramedics training institutes are serving our requirements of developing human resource and skill sets, the COAS remarked. The COAS emphasized that AMC has always answered the call of duty during national calamities both inland and abroad and disaster management. themselves abreast of the latest development. 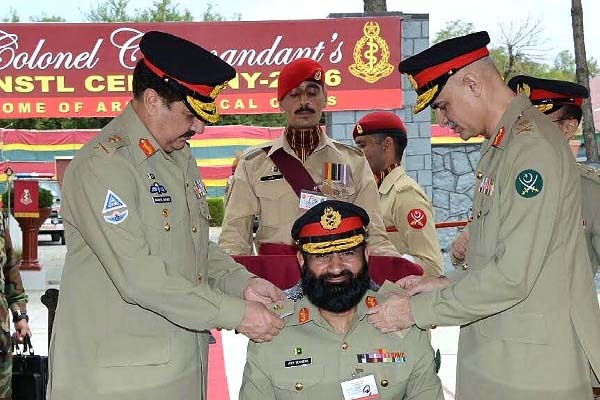 Lieutenant General Asif Mumtaz Sukhera to formally install him Colonel Commandant of Army Medical Corps.